That evening right after the night ranger had left and everyone was settling down for quiet hours, one of our near neighbors came banging on the door. She was the owner of a very large, well behaved pit bull which was always on a leash. An unleashed dog had wandered into her campsite. She was more than mildly inebriated and got very scared and upset and was entreating us to “Get that guy to put his dog on a leash.” I went out and told the fellow that all dogs need to be on a leash. The next thing I know, the two of them were screaming at each other about pit bulls and leashes and whose dog might attack whose. And I was there standing between them. I turned to the inebriated lady (who I’d had friendly encounters with several times across the previous 2 days) and gently told her to go back to her campsite. And she did! Then the other guy told his story about his dog who usually heels really well and is good around groups of people, etc etc. And I nodded and then said, it’s situations like this that are the reason all dogs need to be on a leash. He apologized and we all went home to go to bed. Whew. All done, right? Noooo. When I got back to the trailer, Walter was on the radio with the night ranger because he thought we had a serious situation developing. So I got on the radio and assured the ranger that it was all handled and no one needed talking to since they were all settled down. When that was done THEN I sat down and got shaky because I realized that it could have been a REAL mess that I’d stepped into. But it wasn’t and it was all good. It took me a while to unwind and go to sleep but so goes the adventure. We call this deepening our skills as camp hosts. The next morning the fellow with the sailboat arrived and retrieved his boat and moved it to the area just inside the sand spit. Walter seems to have taken the boat on as his project to watch over and checks it every day now. 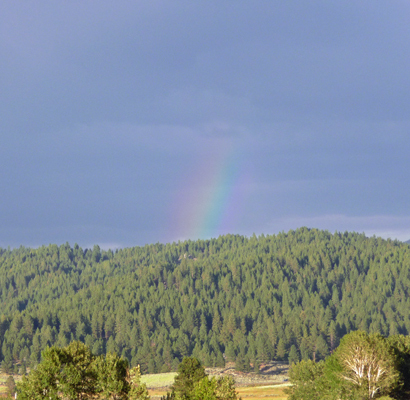 Sunday it was cloudy and cool much of the day but the sun came out late in the afternoon/evening and I spotted a rainbow over the mountains to the east. The ranger in charge of our irrigation had the day off so we just opted to turn the system off since it had rained. 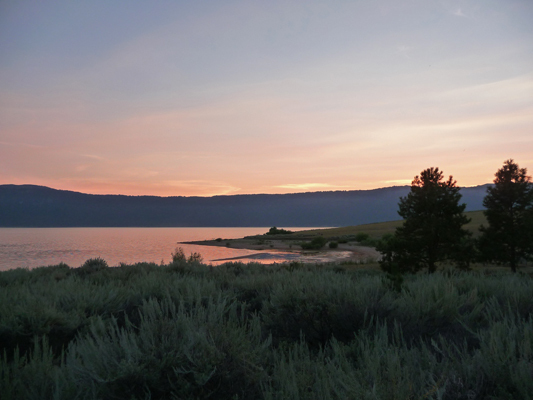 The night ranger took a look at our geyser spot and confirmed a line break and put it on the roll out list for the next morning—it’s still not fixed because they couldn’t find the part they needed locally. We had adventures all week with the irrigation and it only ran for a few hours this week even though the forecast had temps in the 90’s late in the week. The good news is that it ran without much of an issue this Monday morning, August 3rd (just the geyser area came on when it wasn’t supposed to but Walter knows how to make the system skip on ahead so that got fixed). 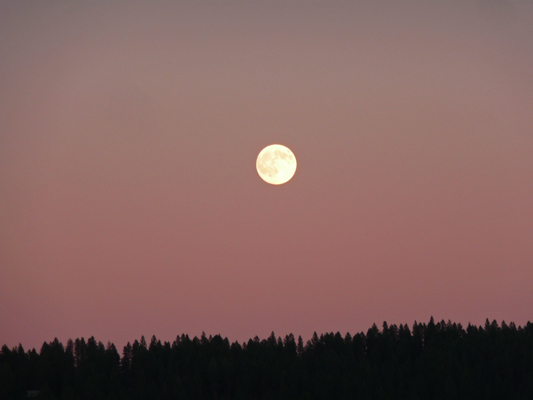 And to the southwest with a tiny nearly full moon up on the left. Monday the campground emptied out to the point where we only had one reservation and a couple of walk-ins late in the day. Ah blessed quiet. It was cold that night and we even had to run the heater to warm up the trailer in the morning. 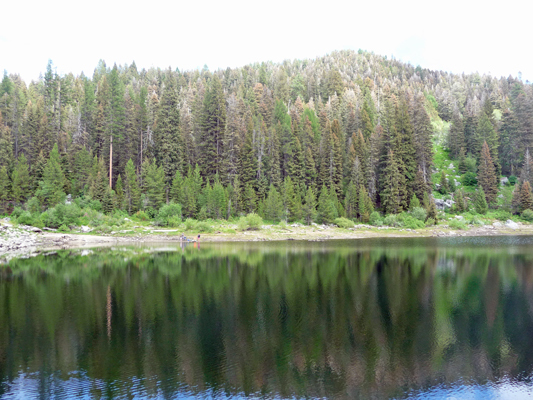 The lake was as still as I’d ever seen it—not like glass but close to it. The forecast was for sun but temps only in the mid 60’s along the lake. 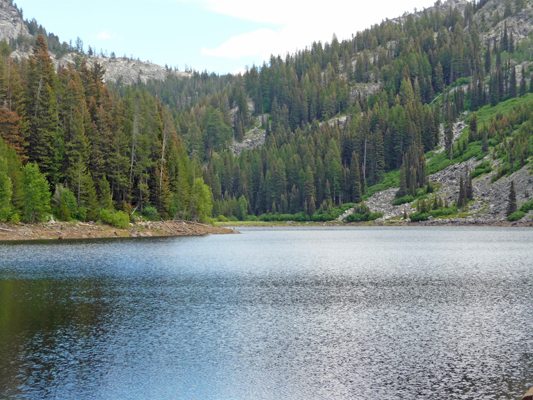 We packed a lunch and headed up to the Boulder Lake trailhead to take the hike to Louie Lake. We’d left our hiking book back at the trailer because the print out from on-line made it sound so simple and straightforward. The drive out was one of those tests of faith where you keep following the dirt road hoping you’re on the right spur. We passed a road crew part of the way up and they assured us we were heading the right way. We didn’t see a car the whole way, so boy were we surprised when we reached the trailhead and there were cars everywhere. 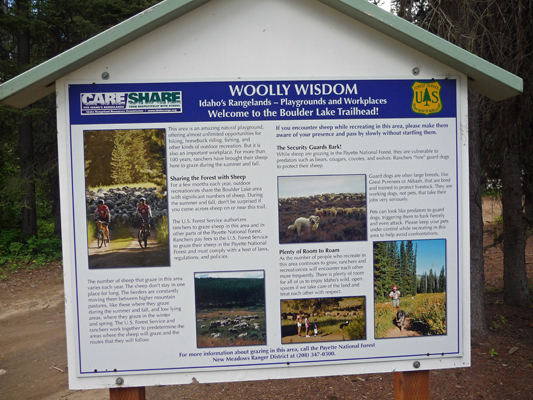 We found a place to park right next to the trailhead sign—which was all about sharing your forestland with sheep! And no info about the trails. 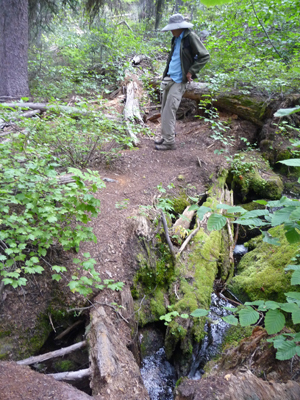 Our trail guide helpfully said to “walk through the trees to the creek and a crossing on logs.” We tried that at several locations and found the creek but no logs. We stopped and talked to some folks and they directed us to a trail that crossed over the dam at Boulder Meadow Reservoir just up the road a piece. This led us to what we thought was the old jeep trail described in our trail guide. So we followed it up the hillside. 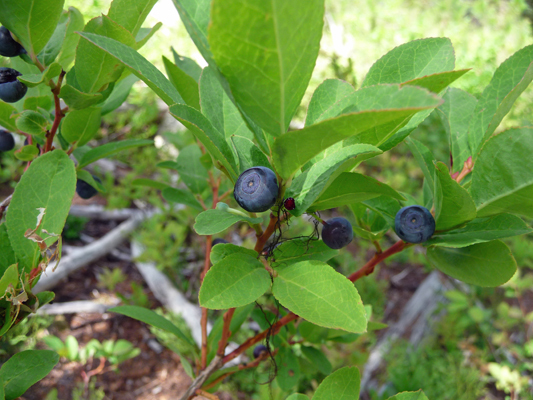 There were lots of ripe huckleberries along the way and we munched our way along the trail—the berries were perfectly ripe and yummy. The jeep trail petered out and we opted for the trail that headed off to the left since the one to the right didn’t seem to go very far. 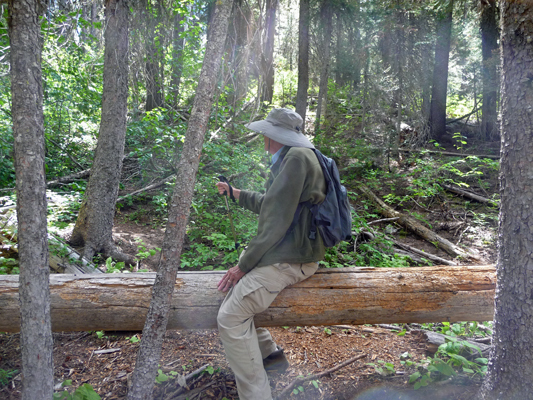 The trail hadn’t been tended for a while and there were lots of downed trees to scramble over. There was a small creek crossing that was downhill which made it that much more interesting (and even more challenging on the way back). The berries got thicker and thicker and I got clearer and clearer that we were on a berry pickers trail and that we probably wouldn’t find Louie Lake. The trail finally ended in a huge huckleberry patch. These berries weren’t as lusciously ripe as the ones lower down but they were still really good. We rested and I picked berries and then we headed down hill again. We met a fellow crashing around in the bushes (watching grouse) and he too was looking for Louie Lake and he decided he’d continue on and keep looking. We went on down hill and of course lost the trail pretty quickly since it was very faint and it’s always harder to see them on the way down hill. We found the creek but no crossing. 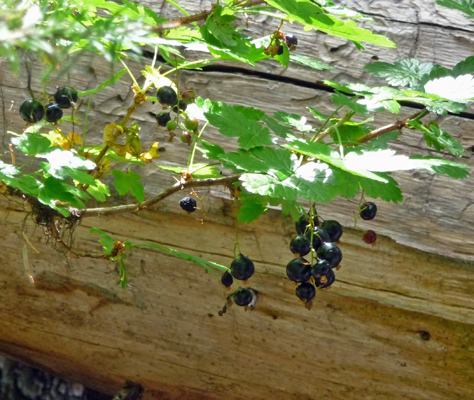 But I did find a whole lot of Northern Black Currants (Ribes hudsonianum). I sampled them and spit them out—ugh. Too bad because they were really thick along the creek. We crashed around in the bushes for a while (this is not my favorite part) and once again found the trail—yippee—and the creek crossing. From there it was clear sailing back to the reservoir. 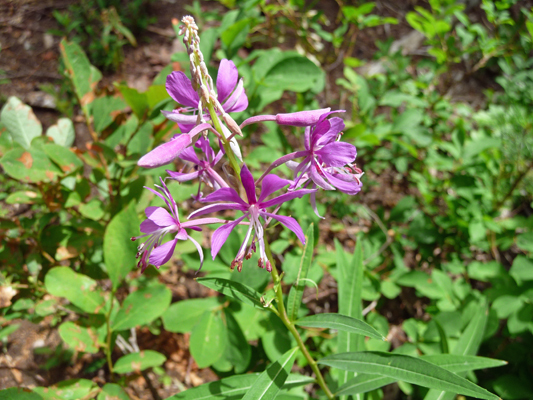 We passed some fireweed just starting to bloom. There’s not been a lot here which is surprising. And we got a nice view of one of the local peaks. We picked a spot on the southern shore of the reservoir for our lunch. For a while it was mirror smooth and I got this shot straight north and across the lake. There is a lot of die off going on in the forests here. 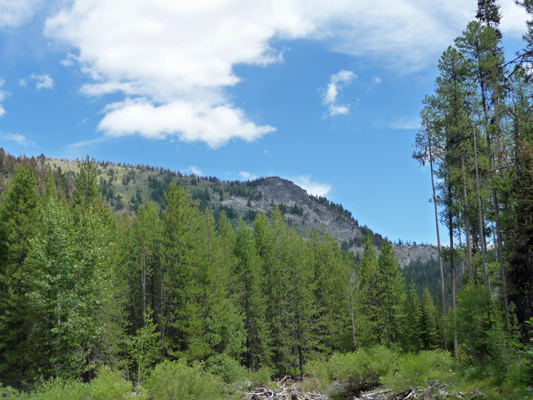 They have bark beetle and some kind of bud worm that causes the new growth on the fir trees to die. So there’s a lot of brown and maroon in the forest where it should be green. Given the heat this summer it doesn’t bode well for fire season. But Tuesday fire was not in our minds. It was sunny but only 55 up at this elevation—perfect for hiking. 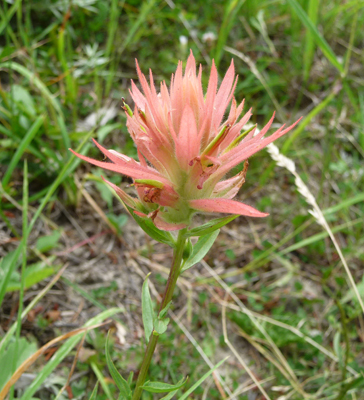 Surprise, surprise there was paint brush in bloom along the trail back to the truck. 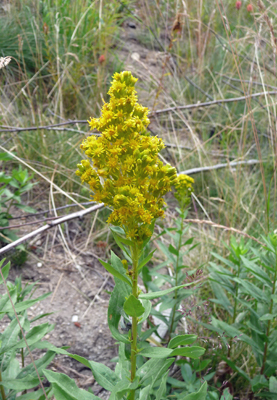 And Rocky Mountain Canada Goldenrod (Solidago lepida). When we got home we got out our hiking book and discovered that there was a map AFTER the trail description which we hadn’t noticed and it turns out the trail to Louie Lake takes off at the other end of the parking area from where we started—wouldn’t you know. If we get some more cool weather we’ll give it another try because it’s pretty country. Wednesday we did our errands and laundry in McCall and had lunch at Ponderosa State Park again. It was still cool and pleasant but the forecast had it heating up towards the end of the week. And of course our reservation listing for the weekend was filling up too. 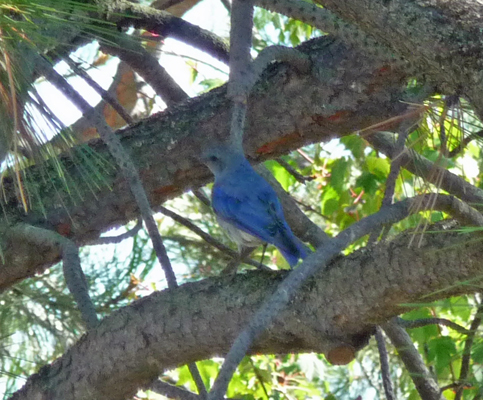 That evening I caught a Mountain Bluebird sitting in the pine next to our trailer. 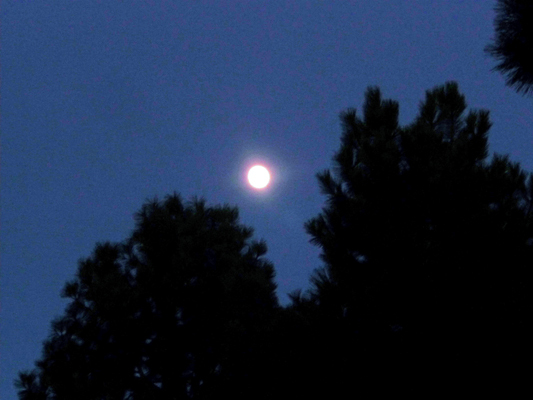 And then the nearly full moon rose over the pines later that night. and paddled over to the sailboat to see how it was doing. Walter had talked to the owner mid-week because it really looked like it might end up high and dry. He swore that he only needed 8 inches of water to get out. We measured the depth with our paddles and there was 12 inches on one end and a few more on the other. The lake is currently dropping about 2 inches a day so we thought he miiiight be okay. As it turned out on Saturday morning he needed the help of someone in a power boat to pull it off the sand spit and out into deeper water. 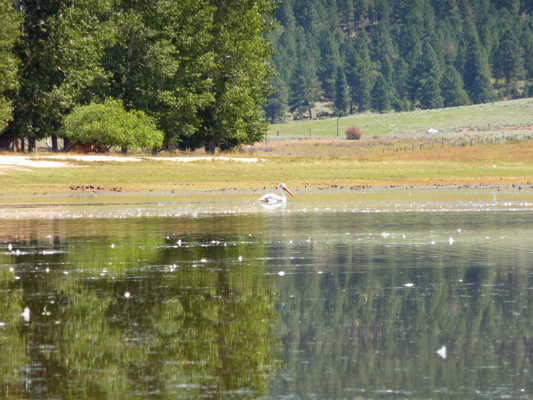 Then we paddled out to the far end of the back bay where one of the pelicans drifted by for me. 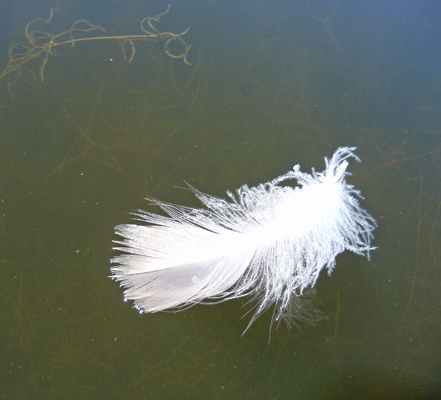 There were lots of feathers floating on the water—goose? pelican? duck? all of the above? 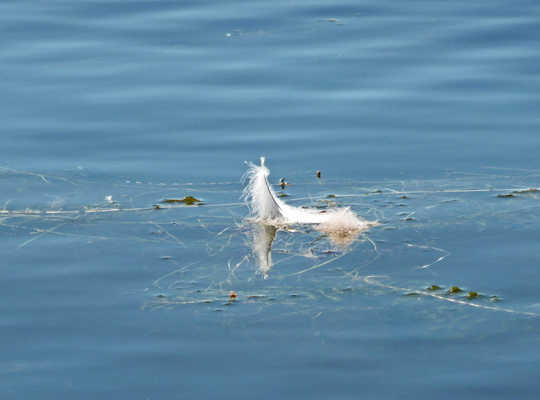 It was quite the challenge to get the boat to slow down enough (but not disturb the feathers) for me to take a shot of these little bits of fluff. 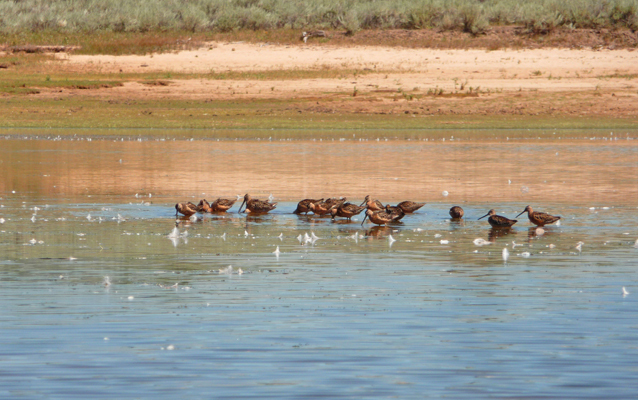 There was a flock of Short-billed Dowitchers (a kind of sandpiper) standing in the shallows along the point. 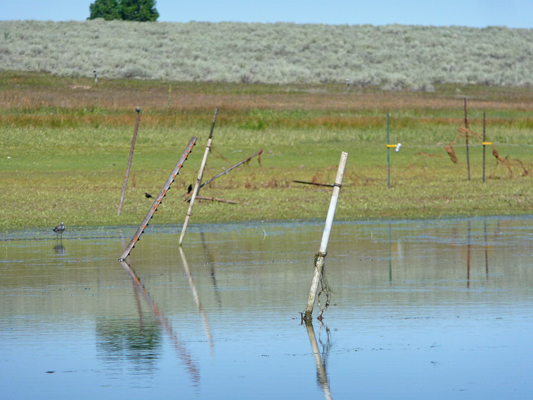 I almost got stuck in the shallows trying to get a view of the cattle fence that runs across this section of the lake. I got myself out of the shallows and around the other way to take this photo of the fence as it climbs up out of the shallows. You may notice that it seems to be missing some key components—like wire. In the background you can see the fence that they rigged up a week or so ago to keep the cattle out but of course the lake continues to drop so... One of these days one of the brighter cows will figure out that the wire ends at that yellow and white gizmo and it will wander to the other side. And where one cow goes, others will follow. We reported it but who knows if anyone will do anything about it until the first of the cattle make their escape. 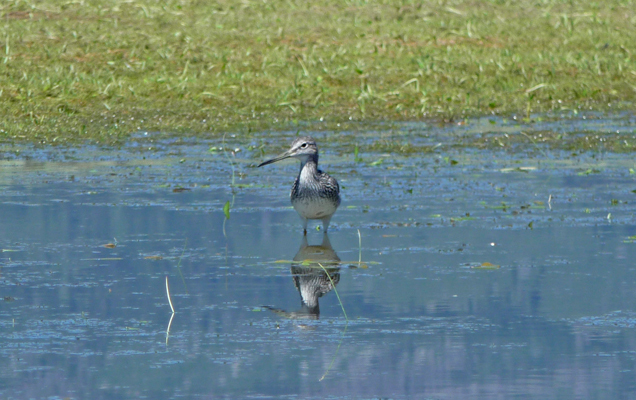 Down near the fence posts I spied this Solitary Sandpiper. He strutted around for a while and I got several fun shots of him. 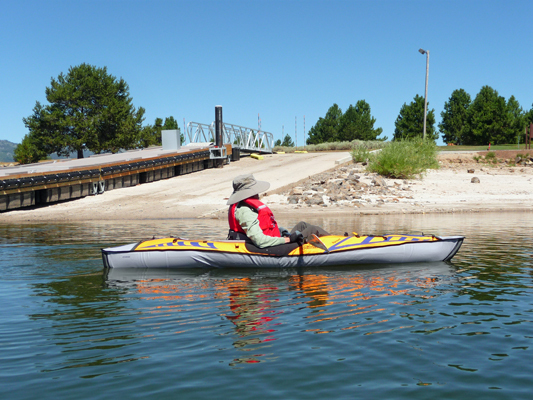 Having thoroughly explored the backwater—which is getting shallower every day--we turned around and paddled back. When we went to get our boats out of the water, we noticed a big truck making a delivery in the parking lot. The crazy contractor working on the fixing the mess he’d made of the landscaping while redoing the boat ramp had just had 3 1/2 pallets of sod delivered. So, you say, what’s the big deal? It was 90 degrees and about 15% humidity and was due to be that hot or hotter for the next 3 to 4 days. And the irrigation down there hasn’t been fully repaired. The darned sod could die really quickly. We radioed in the info only to discover the ranger in charge of our irrigation had gone off duty early and wouldn’t be in until the next morning. (It turns out he’d had to go to Boise for a root canal). So we figured out how to set up the irrigation to run manually and got the water going just in case. Earlier that morning, they had turned off the system to move the intake further out into the lake and hadn’t stopped to re-prime the pump so we didn’t know if we could get it started at all. It took a bit longer than usual to get the system charged up but we got it running okay. Hurray for us and the internet where we found the instruction manual for the controls. 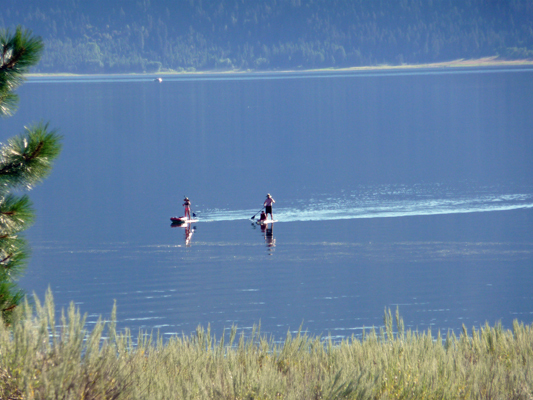 Late that afternoon I spied a pair of SUP’s out on the lake. 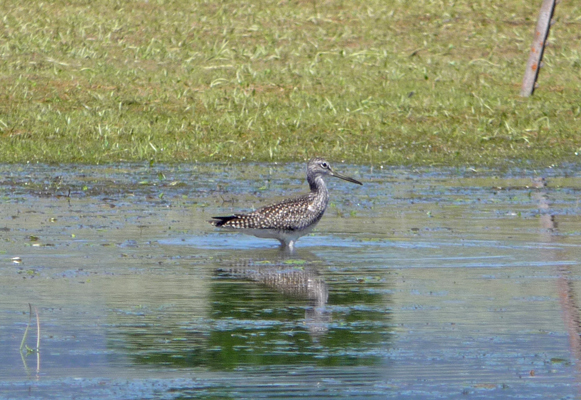 You can see how glassy it still was even in the afternoon when the wind usually blows. It took me a while to decide what in the world the strange lump was on the man’s board. It’s a person—probably a kid sitting down on the board. Just after this we got a call on the radio asking us if we were going to be home that evening because a ranger and perhaps the manager of the park would need our assistance with watering the sod. Oh goodie! And we thought we were all prepared too. As it turned out they brought hoses and two Rainbirds to water the sod rather than trusting the untested new irrigation for watering. We set up two hoses and the Rainbirds and discovered that there wasn’t sufficient pressure in the drinking water system (it runs on a separate well) to run two Rainbirds. This is good news. They’ll never ask us to water this campground with hoses and Rainbirds because there isn’t enough water pressure to do it. So we set up one sprinkler and ran it for an hour and then moved it to water the other half of the sod. And of course, I checked on-line for watering instructions for newly installed sod. It needs to be watered at least 3 times a day for a week. So we’re back to dancing with sprinklers again! But this time there’s no hose dragging. 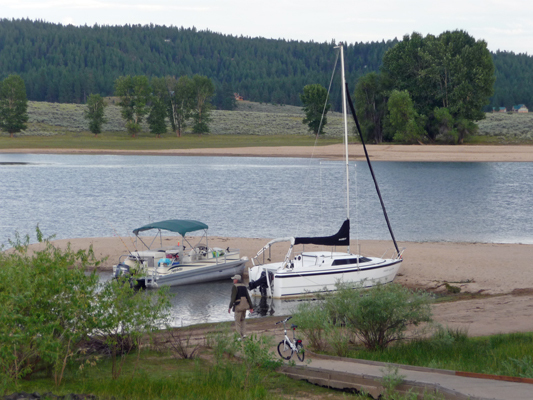 We just drive down to the boat launch and turn it on and then an hour later drive down again and move it a ways and then an hour after that go down and turn it off –three times a day—9 trips total which is why we’re driving, along with the fact that it’s been in the high 90’s. We were told that hopefully the new irrigation would get checked out on Monday and they’d be able to water the sod automatically but I’m not holding my breath since no one has been working on it. 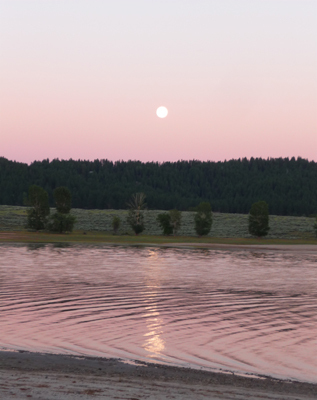 Thursday night when I went down to move the sprinkler late in the evening I caught the nearly full moon reflected in the inlet. With my zoom lens I even managed to get a decent close-up of the moon. 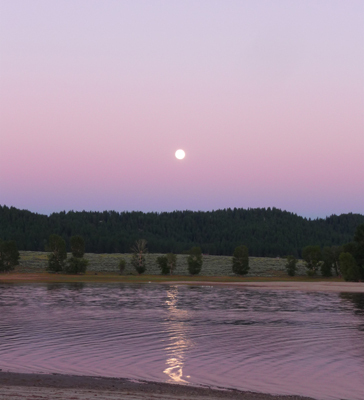 A little later I caught the moon on the water when the color was a bit rosier. 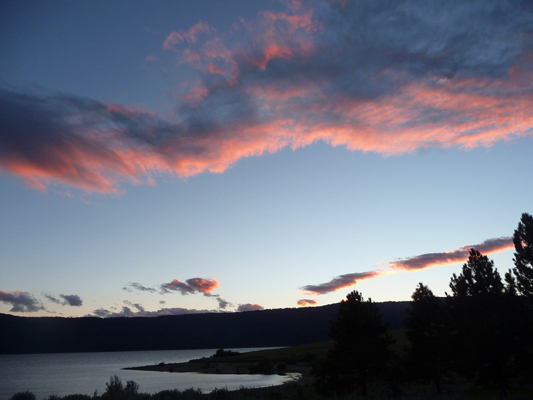 On Friday July 31st, we were due to have 37 sets of new campers arrive and we had two open sites that would be up for grabs to boot (just for Friday night of course). This calls for a quiet laid back morning in preparation for a long evening, especially since it was going to be hot again. We turned on the sprinkler down on the new sod and did our rounds and settled down for a quiet morning. 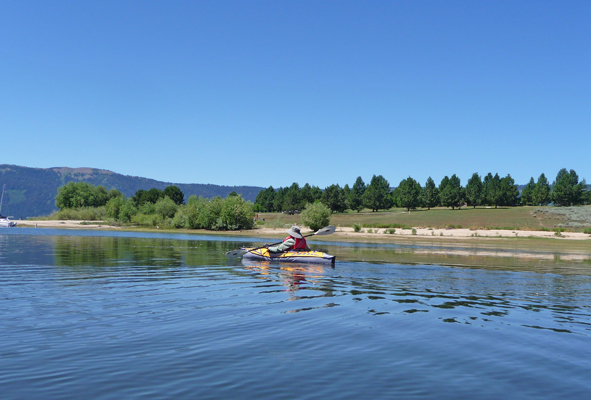 And of course what we heard instead was that the hydroseeders were there to blow on grass seed down at the boat ramp! If putting sod in during the summer was lame brained, then hydroseeding in the middle of summer when we might have a thunderstorm or two before the irrigation was working, was insane. Once the seed gets watered it starts to germinate and if you don’t keep it moist it will die. I was ready to lie down in front of the truck to stop them but hey, they would have just driven around me. It didn’t take them long but they did it. All we can do is pray it doesn’t rain before the irrigation gets tested and is ready to run. Or else it will die and they’ll have to do it again. We actually ended up watering a little bit of it because they applied some just across a walkway from the sod and it gets watered when we water the sod. 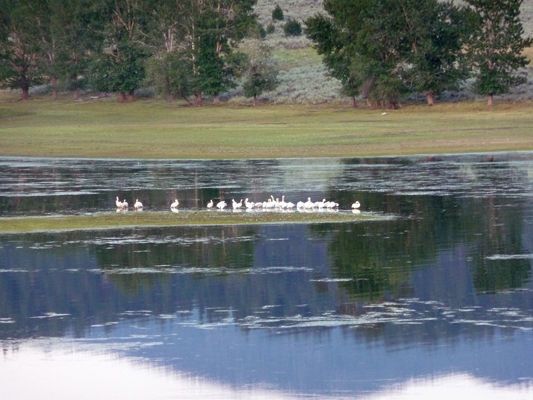 The pelicans all congregated on the point in the back bay that evening so I walked over to take their photo. It looks like there were about 25 of them—way more than usual. 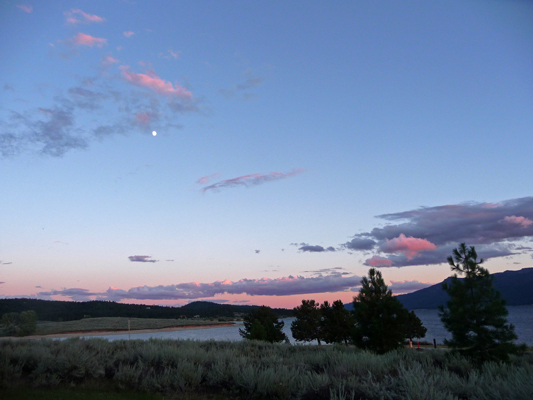 And then I got a nice shot of the sunset too. I do love it when it does this peach-colored thing. At 10 pm we had a bunch of generators running so I went out and let folks know that quiet hours had begun and they all shut off (or so I thought but it turns out I’d missed one). At about 11:15 pm there was a knock on the door (it was still in the 70’s so we had it open). Someone (who of course had left his generator running until his neighbor had to ask him to shut it off at 10:30) had left his dog in his trailer and gone away. The dog had been barking for 45 minutes. Could I do something about it? Well, only if I could find the guy. I thought about it and realized he was a friend of some folks down the hill and I took the truck and drove over. I got out and asked if any of them belonged in the site in question and let them know that there had been complaints about the dog barking. They had two choices:They could go get their dog and have him there with them or they could go back and keep him company. When I drove a second circuit the guy was heading back to his rig. Yeah! I thanked him and got an ear-full of complaint about the dog not being that loud and who complains about dogs barking etc. But the good news is there were no more complaints. Another win for our team. Saturday was hotter. It got up to 96 degrees. We got the water going on the sod (it’s so much easier than watering at Buttercup that we shall not complain), did our rounds and then hunkered down in our rig. Aside from the fun with the folks who had registered for 2 nights when there was only one night available it was an easy day. The rangers fixed things up nicely and no problem ever really manifested. I just walked the campground with my flashlight a little after 10 and magically all the generators shut off as I passed by. Sunday was forecasted to be hotter still. The campground emptied out—even more than expected because 3 of the parties who had reservations for Sunday night went home mid afternoon. It was 98 in the trailer by 3 pm (hit 99 outside) so we turned on the air conditioning. There are fires burning in Eastern Washington and up in Canada and their smoke is coming south into our area. There was a haze of smoke hovering over the lake. There wasn’t much wind so the smoke hung in an even layer for quiet a few hours until the breeze mixed it up eventually to make everything hazy. There are thunderstorms in the forecast for Monday evening with the possibility of dry lightening—not good—but it’s also supposed to cool down into the low 80’s which will help a lot in terms of fire risk. It’s cloudy and 80 degrees here a little after noon on Monday, August 3rd. Every week brings new experiences and we develop more skill at this camp hosting bit. One of the rangers says we are ‘the best’ and it is nice to hear that we seem to be filling the bill for someone. One of our campers, who left Monday morning stopped by to thank us and gave us a tip! “Go buy yourself some burgers—you were wonderful hosts.” Now that was a first.